When I first starting sewing again about 4 or so years ago I started with three things…..pillowcase dresses, pinafores, and circle skirts. And I sewed A LOT of them. A LOT. Hannie had pillowcase dresses, pinafores, and circle skirts in every shade of the rainbow and every print available. And then I kind of started to branch out….. So, when a couple of weeks ago I found a cute 1950’s pattern with a darling circle skirt and a (insert swoon here) very-fitted-white-blouse-with-a-Peter-Pan-color-and-fancy-sleeves-and-darts that I absolutely loved, I knew another circle skirt was on the horizon. The (swoon over) blouse is still on the sewing list. 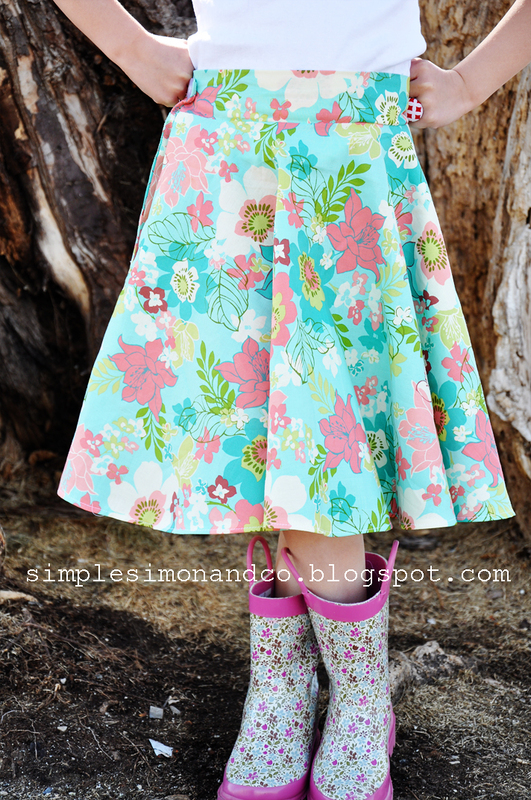 So, I give you…..THE CIRCLE SKIRT WITH ADDED POCKETS……cause every little girls needs some great pockets. Cut out your pockets. You will need 4. This pocket piece came from another pattern, so just find one that works. Or you could draw your own. Then, pin (with right sides together) one pocket to the front half circle (the arrow is on the front piece of the skirt) and then pin one pocket to the back half circle. See those two pins above. Those are marking my notches. Sew from the top of the skirt down to those notches. (You know how a pocket goes in and down—-this is the part shown on the outside of the skirt. The down part will be sewn inside). 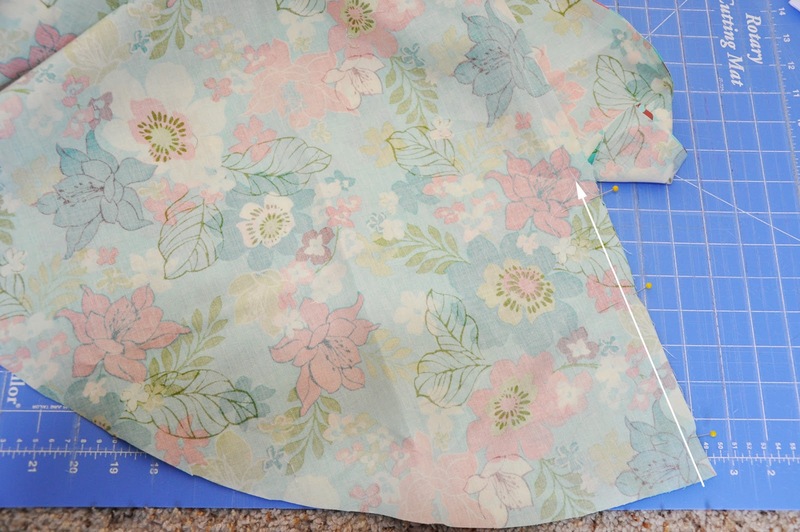 Sew that seam on both the front and back half circle like shown below. Now take the skirt front and back and put the pockets together. You are going to sew the whole pocket now. (Sorry about my crazy photoshopped line….let’s pretend it’s straighter.) 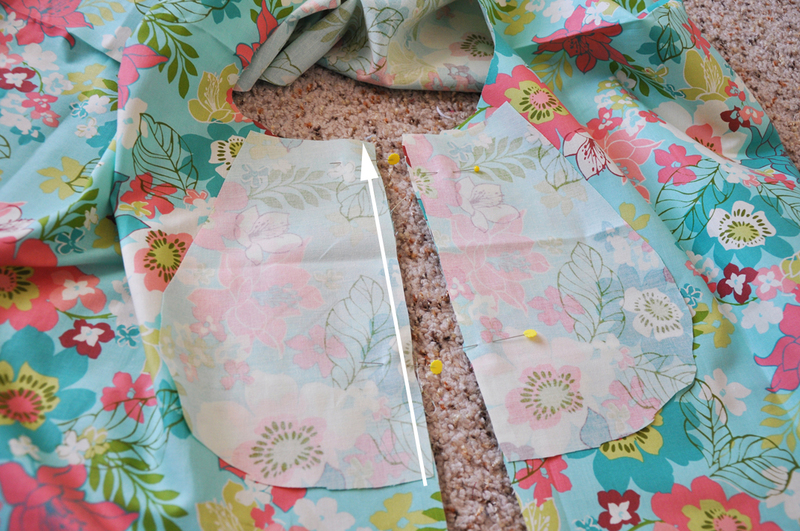 On the bottom, remember to just sew up the pocket….DO NOT SEW THE SKIRT SEAM IN YET. Here is the tricky part. 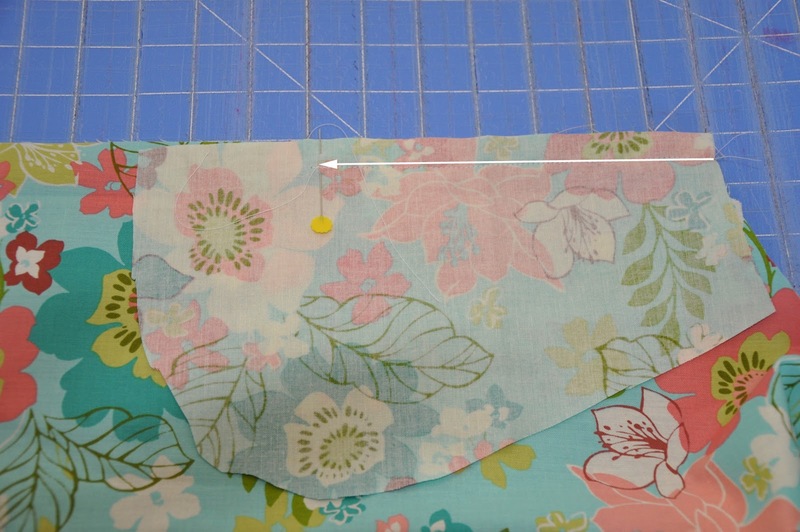 Sew the skirt seam (under the pocket) to the EXACT place (on mine I had notches)in step 2. If you have done it correctly it should look like this…..if it is a bit wonky (you’ll know if it is)…..don’t worry, just pick it out and try again. I had to unpick one side. IT’S TOTALLY OK. Just try until you get something that looks like this on the right side of the skirt. Press the pocket inside and to the front…and you should have something that looks like this. The left is the top of the skirt where the waistband will go to finish the skirt. Repeat for the other side and then finish your skirt. And pat yourself on the back….YOU TOTALLY JUST PUT IN POCKETS. The rain boots just make it the outfit, don’t they? Thank you for the tutorial. What a cute skirt. Very cute! I love the idea of adding pockets. It turned out so cute…I still love that fabric! loved your tutorial. will add this to the nex circle-dress i make. I’m gonna use it today. but… can you try and find the pattern for the skirt (or give me hints ? Thanks for that I made 2 sets of pockets I have to make a prom dress in April I need all the help I can get do you have a tutorial on a bodice by chance?